On Aug. 27, 1930, Federal Prohibition Agent Ray Sutton filed his routine daily report from his post of duty, Clayton, N.M., to the deputy Prohibition administrator of the Albuquerque, N.M., Office. That would be the last report he ever filed. By the following evening, when officials became suspicious by Sutton's failing to file his daily report, a local sheriff searched his room at the Hotel Seaberg in Raton, N.M. The sheriff found Sutton's personal effects and portfolio records, including his everyday topcoat. Sutton had not checked out of the hotel nor had he been seen there since Aug. 28. Before becoming a Prohibition agent, Sutton was a well-known figure in the county. He served several terms as the sheriff of Clayton, held other local offices and served as a vice-president of a bank. 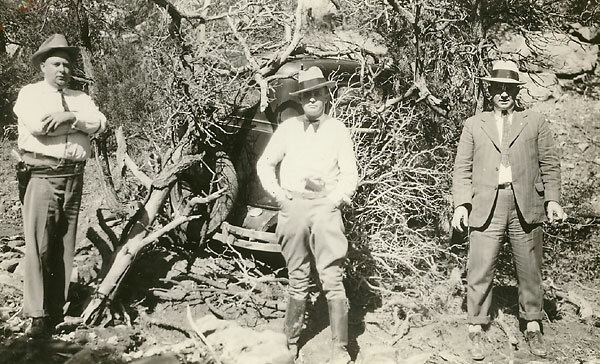 Sutton had been a Prohibition agent seven years to the month when he mysteriously disappeared while investigating a ring of bootleggers in northern New Mexico and southern Colorado. He had been working out of Raton and living at the Hotel Seaberg since Aug. 22. Deputy Sheriff Boots Fletcher of Raton was the last known official to see Sutton alive. On the afternoon of Aug. 28, Fletcher passed Sutton standing alone by his government-owned Pontiac sedan about seven miles south of Raton. The deputy gave Sutton a friendly wave, assuming that Sutton was waiting for an informant. Sutton waved back and was never seen again. Prohibition Agent C.U. Finley was assigned to head up the investigation and coordinated the various officers and volunteer citizens who searched for the missing agent. Finley reported that "50 automobile loads of men from Clayton and northern New Mexico joined in the search for Sutton's body." Around Sept. 9, Finley discovered that Sutton's government paycheck for his July expenses, amounting to $152.35, had been cashed on Sept. 1, at the Harvey Eating House at the Santa Fe Railroad Depot in Trinidad, Colo., by a man representing himself as Ray Sutton. In an effort to identify himself, he presented to the cashier Sutton's Masonic identification card, and a Masonic ring, which he wore on his left hand. Finley tracked down the man who cashed Sutton's check, a local named Perry Caldwell. The endorsement on the back of Sutton's check was compared to Caldwell's signature on weigh sheets from the coal company where he worked; the handwriting was identical and without question belonged to Caldwell. Sutton was known to carry considerable sums of money ? from $100 to $200 ? and usually carried his paycheck for two to three weeks before he cashed it. He also carried two 20 dollar gold pieces in his pockets for years, and often exhibited them, stating that it was simply a fad of his to carry the gold pieces for good luck. During a search of Caldwell's premises, Agent Finley found the Masonic ring, one 20 dollar gold piece, and approximately $115 in varying bills. He also discovered documentation showing that within two days after Agent Sutton's disappearance, Caldwell had paid two overdue bills, as well as a $40 repair bill for his car. Perry Caldwell was arrested and charged with forging Agent Sutton's check. 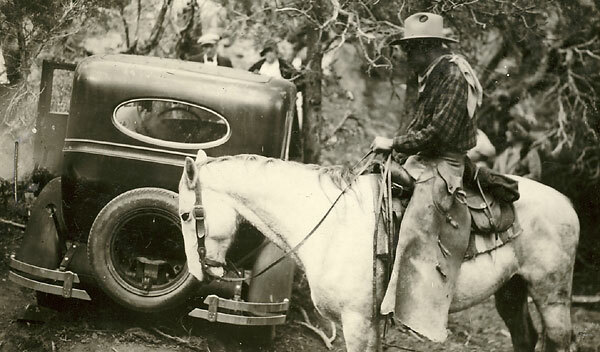 On Oct. 18, 1930, the searchers found Sutton's Pontiac sedan "secreted in a distant canyon 20 miles from Raton, and covered with various bloodstains." The prohibition officers involved in the investigation, the U.S. attorney, and the state officers all believed that Ray Sutton was killed, and his body either buried or weighted and deposited in one of the several water holes nearby the location where he was last seen by Fletcher. During the continuing investigation, Finley secured evidence from a witness in Raton that the head of the moonshine bootleg ring in northern New Mexico had offered him $500 "to make way with Agent Sutton" shortly after Sutton had arrested this moonshiner. This "King of the Moonshiners," as he was called, was a close and personal friend of Caldwell's. Agent Finley discovered that this moonshiner paid Caldwell protection money (while Caldwell was serving a probation period as a prohibition agent). Caldwell had forced local bootleggers to only sell whiskey furnished by "the King." But without the discovery of Sutton's body, the evidence wasn't strong enough to prosecute Perry Caldwell for murder. On Dec. 8, Perry was indicted for "forging and uttering a government check for $152.35 issued in the name of Ray Sutton." 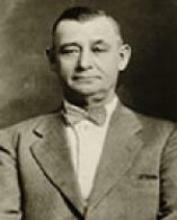 During his trial, two key witnesses, both claiming Caldwell looked like the man who cashed Sutton's check, did not testify; they were intimidated by the bootleg ring which they thought was responsible for the earlier death of another prohibition agent, Dale F. Kearny, and the disappearance of Agent Sutton. In the end, Caldwell was acquitted on all charges. Agent Finley continued to follow leads on Sutton's disappearance for more than 10 years, saying that, "if the death of Agent Kearney and the mysterious disappearance of Agent Sutton were not followed up and the perpetrators of the two crimes vigorously prosecuted, agents in this part of the country will simply become the prey of the moonshiners whenever it is necessary to avoid the penitentiary." Since Sutton had a multitude of investigations against moonshiners and bootleggers, every day new leads surfaced. Although some of the more promising leads included a jailhouse confession by an inmate to his cellmate, and an unrelated newspaper report that bones were found in an isolated water hole in northeast New Mexico called the Devils Washbasin, Agent Sutton's body was never recovered and no one was ever charged with his murder. Although Colfax County, N.M., had a standing reward of $500 (a lot of money considering a prohibition agent's salary was $2,300 per year) for the arrest and conviction of Sutton's murderers, and while hundreds of public-spirited citizens volunteered their services in the early part of the investigation, the mystery of what happened to Ray Sutton remains unsolved to this day. Sutton's body has never been recovered, making him the only agent still missing in action. Sutton was survived by his wife and two children. 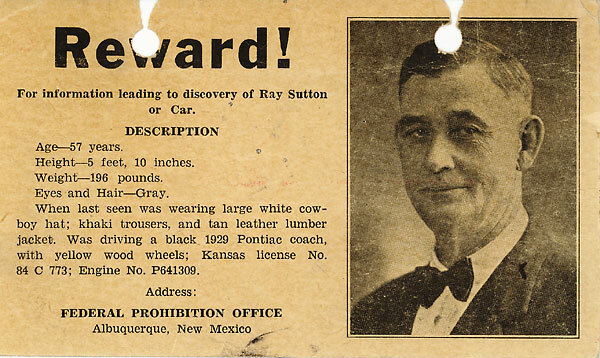 The reward poster for information on Ray Sutton. Photo courtesy of ATF Historic Archives. Searchers pose in front of Sutton's partially visible sedan, still hidden by underbrush. Photo courtesy of ATF Historic Archives.